Combatting moisture is a part of life for homeowners. While nearly everyone is familiar with moisture problems due to faulty or damaged roofs and walls, or from rainwater runoff that seeps into foundations or up through concrete foundation floors, homes built over crawl spaces deal with moisture from another source: water vapor that rises naturally from the exposed soil and becomes trapped in the enclosed crawl space. Moisture in crawl spaces can be a serious issue, but fortunately, there is one fairly easy solution that often corrects the problem. Moisture is one of the main foes of a home's structure—potentially causing both structural problems and health issues. Uncontrolled moisture can cause rot and decay in wood framing and other materials, and it fosters mold and mildew that can cause allergies and asthma. The amount of moisture that is present determines if you can finish a basement, for example. Moisture also determines what type of below-grade flooring you are able to install. It affects kitchen and bathroom walls, floors, and especially ceilings. At its most extreme, moisture can even determine if construction of a home or room addition is possible at all. Where moisture is a known problem, vapor barriers are integrated into wall, ceiling, and floor construction to combat the effects. But nowhere is moisture more damaging than in a crawl space, even though it is not seen. Because the crawl space has direct contact with the ground, it should be no surprise that moisture will develop here. It is difficult to overstate the problems that can occur because of crawl space moisture. One of the most serious problems caused by moisture is mold, mildew, and other fungi. According to the CDC, mold can cause nasal stuffiness, throat irritation, coughing or wheezing, eye irritation, and skin irritation to people with sensitivities. And people with mold allergies can have much more severe reactions, including lung infections. Eliminating mold is difficult, and fully remediating mold-related problems is expensive. Mold's effects go well beyond just harming people. As a direct byproduct of crawl space moisture, mold can blacken floor cavity insulation and structural elements. Because there is often no light and only minimal ventilation in a crawl space, the problem never improves unless preventive or remediation methods are enacted. Structural elements of your house, such as joists, sills, posts, and beams, are made of wood. Being an organic material, wood will begin to rot when it comes into contact with water for prolonged periods. Animals of many types are drawn to water and can infest your home. These pests include carpenter ants, termites, rats, mice, snakes—even skunks and armadillos. Even where moisture has not yet created obvious problems, its presence may turn away home buyers and erode the resale value of your home. When you try to sell your house, the property inspector will explore the crawl space and note the presence of water on the report. Prospective buyers will almost certainly want the problem fixed or demand a lower sale price because of it. One method of controlling crawl space moisture is with a very simple and inexpensive project: laying out rolls of ordinary sheet plastic. Traditionally, this plastic has been called a vapor barrier, but this strategy has been retitled by the U.S. Department of Energy, which now defines it as a vapor diffusion barrier. This is a more accurate term, since plastic sheeting, even with seams sealed, cannot seal off 100 percent of the moisture migration. Rather, the plastic slows down the process. 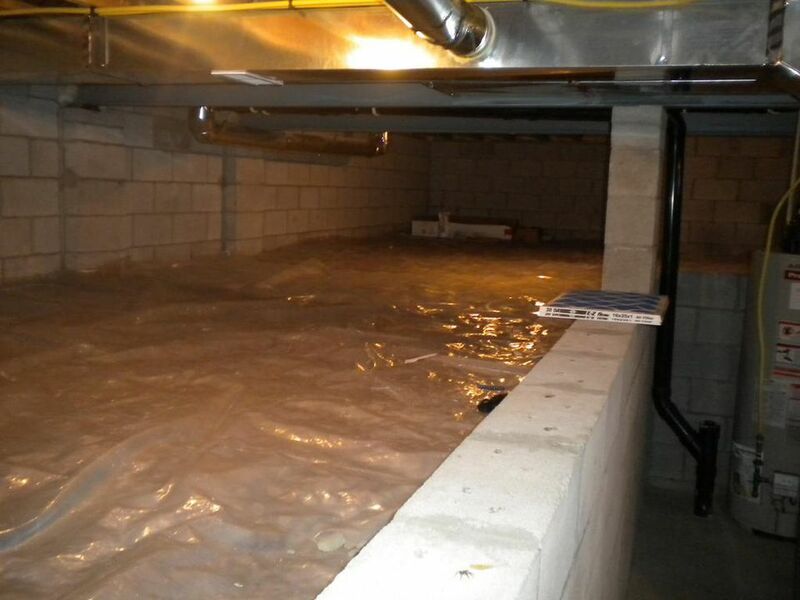 A high water table or rainwater runoff may be causing water to pool in the crawl space. In this case, you will need to hire a water remediation company. In most cases, they will dig a trench around the perimeter, add drain pipe, cover the pipe with drain gravel, and add a sump pump. In other cases, adding roof gutters and downspouts, and reconfiguring the earth grading may be enough to eliminate pooling water. Leaking plumbing pipes, either water supply pipes or drain pipes, may be allowing water to pool up in the crawlspace. Water leaking from damaged pipes above must be fixed before you put down a vapor barrier, or water will simply pool up on top of the plastic sheeting. Installing a vapor barrier is not a complicated or expensive project, but it can be hard work because it requires a lot of crawling on hands and knees. While it is possible to do this job by yourself, it helps to have at least one helper to pass items through the crawl space door and to help with rolling out the plastic and taping the seams. A good work light is essential to working safely and efficiently in the cramped space below the house. The entry hatch to a crawl space is not always obvious. Sometimes it is located outdoors, along the perimeter wall of the crawl space. In other instances, you will find an indoor entry hatch in a closet, pantry, or utility area. If your floor has wall-to-wall carpeting, look for a square seam in the carpeting that indicates a hatch door. It is best to begin with a crawl space that is as dry as possible. Methods for drying out a crawl space include: using a dehumidifier; setting up fans; removing wet materials, and using a pump to discharge any standing water. You may need several days of effort to dry out the crawlspace before you venture down to lay vapor barriers over the ground. Crawl spaces are notoriously messy, as construction workers often toss discarded building materials in this space. Remove all debris, especially anything sharp that might puncture the plastic. To the degree possible, level out the ground using a garden rake. Beginning at one side of the crawl space, lay down 6-mil or thicker polyethylene plastic over the entire crawl space. Cut the sheets to size, allowing 12 inches or more along walls. Overlap the seams by no less than 12 inches and secure them with the poly PVC tape. With every house, you will encounter both outer support walls or columns and inner support piers posts. For inner supports, cut the plastic sheeting to fit around them and seal the plastic against the supports using double-sided butyl tape. The goal is to provide a solid barrier against the ground. Where necessary, you can cut additional small pieces of plastic to seal any gaps and ensure a full barrier. Around the perimeter of the crawlspace, extend the plastic sheeting about 12 inches up the walls and secure it in place with double-side butyl tape. Plastic vapor barriers will prevent most water vapor from seeping up from the soil into your crawlspace, but improving cross ventilation through the crawlspace is an important additional method that will prevent any residual moisture from being trapped in the space. Vapor barriers greatly slow the migration of moisture vapor up from the ground, but without cross ventilation through the space, some moisture can still collect. Most crawl spaces have inadequate ventilation, and bringing the vents up to code can greatly help moisture issues. In more serious cases, an electric vent fan system can help keep a crawl space dry.